Combo INCLUDES Wood Stand Organizer and NEW Powermod 5-USB charger. A high quality MobileVision brand product that allows you to organize multiple devices and enjoy the leisure of creating a personalized charging station. Looking for an elegant way to charge your smart devices, without the clutter of cables and other eyesores? The Wood Veneer Charging Stand plus Powermod 5-USB Charger is the perfect answer for your all-in-one charging station needs. Powerful magnets secure the lid and ensure devices are safe and stable. The deep base neatly hides cables and wires from sight. The functional design of the Wood Stand complimented with the Powermod Charger, a 5-port customizable USB hub powered by one single AC outlet creates the ultimate all-in-one charging location. 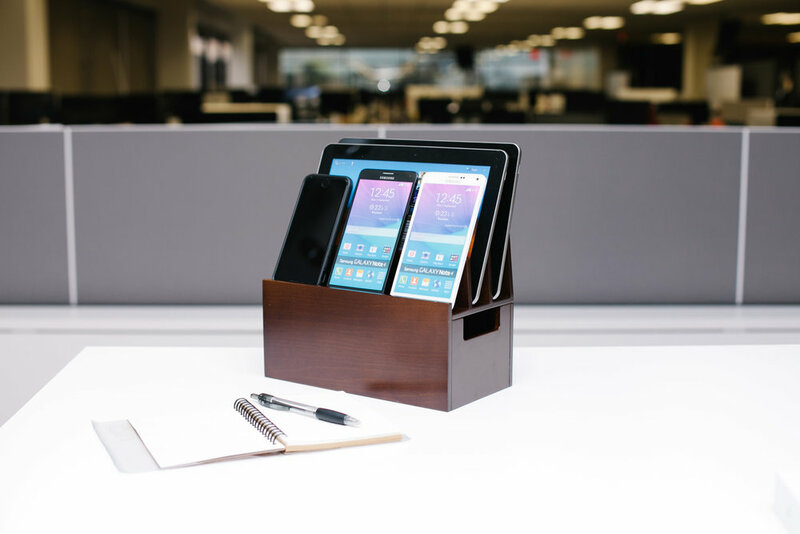 Even on its own, or paired with manufacturer supplied chargers, this Wood Stand provides great storage for smartphones, tablets, and lap tops. Create customizable convenience and style with the beautiful and elegant style of a wooden charging stand.